I was sitting in the first Itsu location outside the U.K.—on 7th Avenue and 39th Street in New York City—when I noticed another food on demand concept inside a food on demand concept. 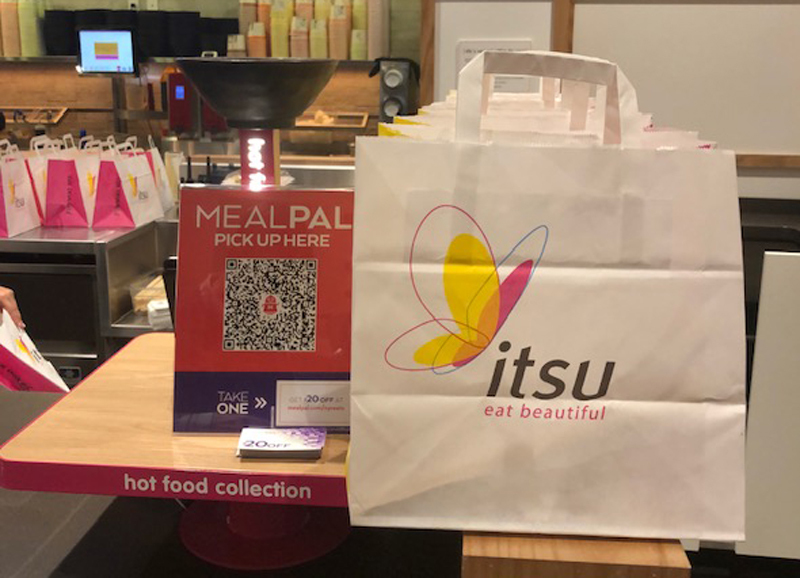 Itsu, a grab-and-go healthy Asian eatery is one of a large group of restaurants that have signed up with Mealpal, a subscription lunch service that promises subscribers lunch for under $6. The participating restaurants choose the meal they want to offer each day, Adam Mullinax from Ambrosiainv, the investment company behind Itsu’s U.S. expansion, Explained. The meals are made ahead and placed in a small shopping bag with handles, next to a sign with a large QB code. The subscribers coming in to pick up their deal have already paid, so they simply use their smartphone to take a picture of the code, show a counterperson their phone’s screen and pick up one of the bags and go. Because there’s a dining room, they could also eat there. Itsu knows ahead of time how many orders to make. On this day it was a sushi roll. The meals change daily, and subscribers go online to see what the restaurant’s offering that day will be. The window to order the next day’s lunch is from 5 p.m. the previous day to 10:30 a.m. the day of. Membership is based on usage. For diners who sign up for 20 meals per 30-day cycle, it’s $5.99 per meal, plus taxes and fees. Taxes vary, ranging from 7 percent in Miami to 10.1 percent in Seattle. In some markets Mealpal is offering a dinner subscription plan as well, but members can’t use their lunch subscriptions for dinners, and vice versa. The dinner cost slightly more—$6.99 for the 10-meals in a month plan, and are available after the lunch period. Mealpal relies on dense urban areas for takeout only. There are no deliveries. “With hundreds of restaurants on the platform, you’ll find plenty of options in your neighborhood. Plus a quick walk will help build up your appetite,” the website states. The added source of traffic works well for Itsu, which already does 70 percent of its business in takeout. They also do delivery with three third-party delivery services (Caviar, Grubhub, Ubereats, plus the newly added Ritual. In addition to the prepackaged sushi, made in the downstairs kitchen, hot dishes can be ordered from the counter, such as soups and noodle and rice dishes. And there’s a large, attractive area for dining in. The concept was founded by Julian Metcalfe, who also started Pret a Manger in the 1980s. Ironically, this NYC location is next door to the sister concept. Like the sandwich shop chain, Itsu prepares food fresh each day and has a deli-style case with a variety of healthy Asian options from sushi to dumplings to edamame. Itsu, the name, which means “whenever” in Japanese, combines traditional Asian elements with some cheekiness, such as the drain next to the tray-return station that has a sign, “Liquid diet. Liquids only, no dry rubbish please,” and a condiment station with the sign, “Pimp your potsu.” The humor is British with some insiderness to it, such as the potsu dish that’s no longer being featured. More Itsu stores for the U.S. are in the works.